Your favorite menacing dummy is back to cause trouble in Goosebumps 2. 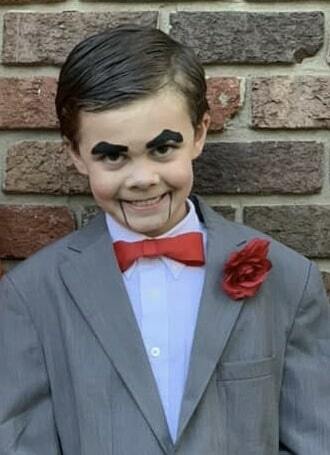 Learn about the film and see how we made this DIY Slappy costume for less than $15. I don’t know how life is in your house, but around here we are smack in the middle of Goosebumps 2 fever and we have been ever since Halloween. 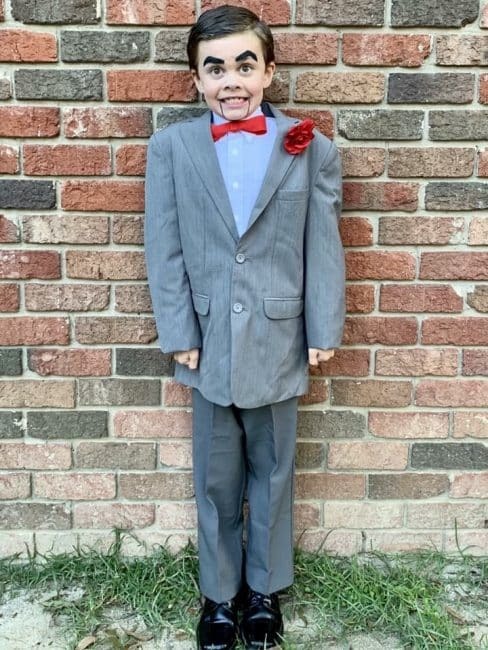 My boys love the books and the movies, and last year for Halloween, my second grader even dressed up as Slappy the dummy! Since then, my kiddo got Goosebumps books and the first movie for Christmas (thanks Mimi!) and reenacts his favorite scenes using a menacing group of stuffed animals all around his bed. Now that Goosebumps 2 is on DVD/Blu-Ray, the excitement is at an all time high! Thanks to Sony Pictures Home Entertainment for sending us a copy of Goosebumps 2! My affiliate links are below, which means I may earn money from purchases made. 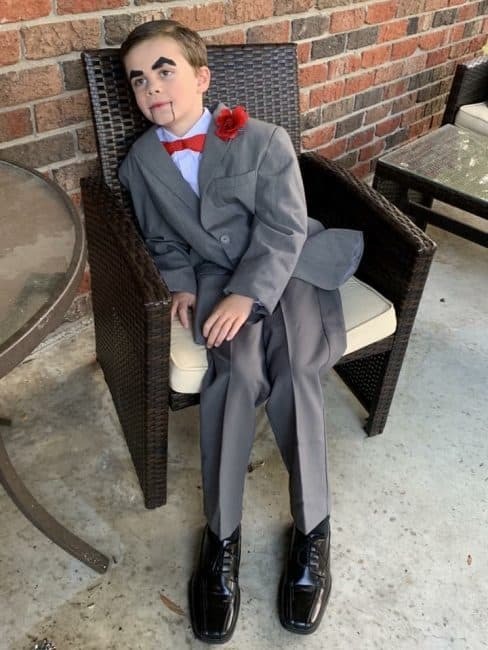 Check out how we made our own Slappy costume and enjoy some other fun Goosebumps 2 activities while you wait to grab your copy of the film! Calvin planned to be Slappy on Halloween for months ahead of the holiday and then a few weeks before, he switched to something else. I had loved the idea of Slappy but you’re only 7 once and if you can’t choose your own Halloween costume, I don’t see the point. Of course, as kids are prone to do, he switched back to Slappy just days before trick-or-treating. Now maybe I would have said no if I wasn’t so excited about the costume in the first place. I really had a vision for Calvin as Slappy and I was looking forward to seeing him in costume. I knew he would look incredible as Slappy, so when he switched back I was all too ready to say yes. I got all of our supplies from a local thrift store with the exception of the ribbon and flower, which I found at Walmart. All told, this costume was less than $15 and only took me 20 minutes to pull together. Honestly most of that time was spent creating the bow tie, which I totally would have purchased if I had found one that day. I used safety pins to attach our bow tie and flower to keep things simple, The rest was just a matter of getting dressed. Can’t get much easier than that! *vacant expression and dead eyes sold separately. We had the best time with this part! All you need is black eyeliner pencil and a some patience. I drew Slappy’s thick eyebrows, filled them in and added lines down from the corners of his mouth to his chin to get the ventriloquist dummy effect. I also added a few smudges to his nose and chin to make him look a little worn. Finally, if your child has longish hair like mine, use some styling gel to keep it in place and give it a little plastic look. My kiddo had the best time trick or treating and continues to wear his costume during playtime. Total win for this mama! Goosebumps 2 from Sony Pictures Home Entertainment is now available on Digital, Blu-ray™ Combo Pack, and DVD and it really is such a fun movie! We saw it in the theater and all really had a great time. Goosebumps 2 is designed to be a little creepy but with the exception of a couple jump scares, it really was more about the adventure. I love that it’s rated PG and the fact that our disc came with digital download means we can add it to the boys’ Kindle Fires! And yes, my little Slappy has already watched it. Twice. Official: Be careful what you wish for. With their after school junk business, best friends Sonny and Sam hope to find treasure in other people’s trash. But when cleaning out the old Stine house, they open a locked book that frees a supernatural nightmare-Slappy! Now, with the help of Sonny’s sister Sarah, they’re in a race against time to get the sinister dummy and all the creatures he’s brought to life back into the pages before he unleashes total pandemonium! Bonus behind the scene, “Take Me Out of the Manuscript” with Slappy. 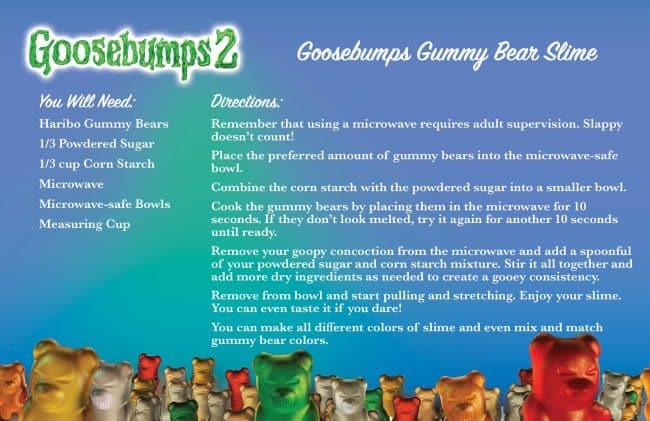 Want even more ways to enjoy your Goosebumps fandom? 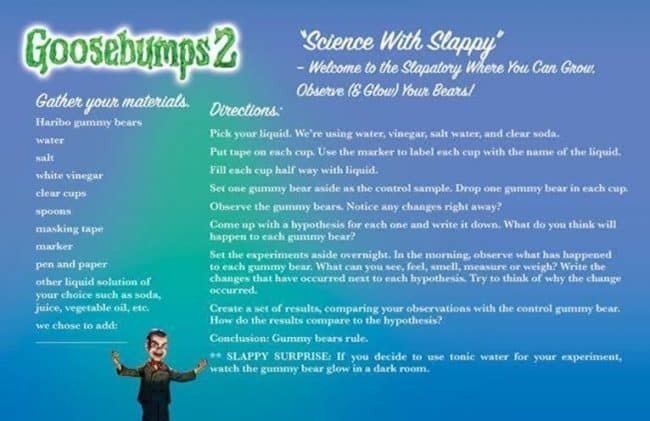 How about some science with Slappy? Check out these fun experiments, grab your gummy bears and get ready to learn!